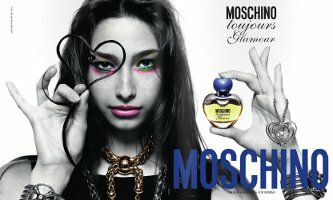 Moschino will launch Toujours Glamour in May. The new fragrance for women is a flanker to 2008's Moschino Glamour. The notes include red berries, violet leaves, cardamom, jasmine, muguet, bitter almond, benzoin, heliotrope and musk. The bottle reminds me of Cover Girl’s Navy. I was thinking that same exact thing! Same bottle as last time, just a different color! Oh man, I used to wear Navy, years ago! One of my first perfumes, in middle school, I think. I had almost forgotten it existed. Makes me want to go pick up a bottle. That’s what it is. I knew it looked familiar. Definitely going to search out this one to sample. Moschino fragrances are usually at least intriguing to me even if I don’t fall in love with them.